Program Note…On May 21st we’re broadcasting live from the studios of Chicago’s ESPN 1000 – WMVP-AM. We’re there to join in the celebration of Chef Andrew Gruel’s Trendsetter MenuMaster Award presented by Nation’s Restaurant News. The vibrant Chicago dining scene will be well represented in the show! You don’t want to miss this show. At the age of 15, Chef Brendan Collins quit secondary school to follow his dream and enroll in culinary school, where he was classically trained in French technique. Today Collins is the Executive Chef and Proprietor of Birch in Hollywood, Larry’s in Venice as well as the Executive Chef of The Corner Door in Culver City. On Sunday, May 15th he’s part of the celebration of the 25th Anniversary of the Hollywood Farmers Market. Congratulations to native Angeleno, Chef Dahlia Narvaez, the Executive Pastry Chef of both Osteria Mozza and Pizzeria Mozza in Hollywood. Chef Dahlia was presented with the 2016 James Beard Foundation Award for Outstanding Pastry Chef in Chicago at Lyric Opera on May 2nd. She is our special guest. From the founder of AmazingRibs.com (Meathead Goldwyn), the hugely popular grilling and barbecue website known for applying the latest scientific research to America’s favorite form of cooking, comes MEATHEAD: The Science of Great Barbecue and Grilling. Meathead is known as the barbecue whisperer and joins us. There is a novel way to experience America’s Riviera, Santa Barbara. The Santa Barbara Car Free Project invites visitors to show their Amtrak train tickets and enjoy car free fun (with special discounts) in Santa Barbara. Laura Kath with Santa Barbara Car Free provides us with all the needed 411. Shrimp is one of the most popular varieties of seafood enjoyed in America. What should you know about sourcing, cooking and enjoying this delicious crustacean? Does size matter? Fresh or frozen? Wild caught or farm raised? Should you pay attention to where the shrimp comes from? Our own resident seafood authority, Chef Andrew Gruel, joins us with all the specifics. It’s a peel-and-eat feast. The Better Burger Battle is heating up again with the arrival of Fullerton’s favorite, The Burger Parlor, in Old Towne Orange. You have a serious fine dining chef creating premium burgers and loving it. They even make their own ice cream for the milk shakes. Burger-meister and Chef Joseph Mahon is with us with all the juicy details. Dahlia Narvaez developed a love for food when cooking for her family after school in Highland Park. Trading the classroom for the kitchen, Narvaez left school for a job at the Conga Room at the age of 22. Looking to take the next step in her career, Dahlia confidently strode through the doors of La Brea Bakery and asked for a counter job. But she never worked a minute behind the counter, vaulting immediately to the kitchen at Nancy Silverton’s Campanile where, in 2003, she was name Executive Pastry Chef. Dahlia left Campanile in 2006 to assume the role of Executive Pastry Chef for what was to soon become Osteria Mozza and Pizzeria Mozza. Dahlia developed the menus and pastry departments for all of Mozza’s LA restaurants and oversees the department in Newport Beach and Singapore. As a side project Chef Dahlia also created the distinctive dessert menu at Chef Chris Feldmeier’s Moruno located in the Original Farmers Market at Third & Fairfax. We enthusiastically recommend the Fried Biscuits with tangerine thyme marmalade and vanilla bean ice cream. It’s really all in the Family as Chef Dahlia and Chef Chris are married. At the age of 15, Chef Brendan Collins quit secondary school to follow his dream and enroll in culinary school, where he was classically trained in French technique. Today Collins is the Executive Chef and Proprietor of both Birch in Hollywood as well as the Executive Chef of The Corner Door in Culver City. On Sunday, May 15th he’s part of the celebration of the 25th Anniversary of the Hollywood Farmers Market. From the founder of AmazingRibs.com (Meathead Goldwyn), the hugely popular grilling and barbecue website known for applying the latest scientific research to America’s favorite form of cooking, comes MEATHEAD : The Science of Great Barbecue and Grilling. Meathead is known as the barbecue whisperer and joins us. There is a new way to experience America’s Riviera, Santa Barbara. The Santa Barbara Car Free Project invites visitors to show their Amtrak train tickets and enjoy car free fun (with special discounts) in Santa Barbara. Laura Kath with Santa Barbara Car Free provides us with all the needed 411. Shrimp is one of the most popular varieties of seafood enjoyed in America. What should you know about sourcing, cooking and enjoying this delicious crustacean ? Does size matter ? Fresh or frozen ? Wild caught or farm raised? Should you pay attention to where the shrimp comes from ? Our own resident seafood authority, Chef Andrew Gruel, joins us with all the specifics. It’s a peel-and-eat feast. At the age of 15, Chef Brendan Collins quit secondary school to follow his dream and enroll in culinary school, where he was classically trained in French technique. By 17, the talented Nottingham native had his first job at London’s La Gavroche, a Michelin two-star restaurant. Today Collins is the Executive Chef and Proprietor of both Birch in Hollywood as well as the Executive Chef of The Corner Door in Culver City. On Sunday, May 15th he’s part of the celebration of the 25th Anniversary of the Hollywood Farmers Market. Chef Collins is performing a cooking demonstration on the Cooking Stage at 12 Noon with a recipe from his new book, Cooking Blokes & Artichokes with a prior book-signing at 10:30 a.m.
As a side project Chef Dahlia also created the distinctive dessert menu at Chef Chris Feldmeier’s Moruno located in the Original Farmers Market at Third & Fairfax. It’s really all in the Family as Chef Dahlia and Chef Chris are married. Goldwyn first began his food and drink career as a soda jerk in his parents’ Sarasota restaurant where is father affectionately nicknamed him Meathead. In MEATHEAD, he reveals in full but accessible detail, the science behind the interaction of fire and food, with foolproof techniques, researched results on hardware, and 118 mouthwateringly, satisfying, and thoroughly tested recipes. After consulting with scientists, Meathead shatters many of the myths that hang around barbecue lore, oftentimes standing in the way of perfection. There is a new, au courant way to experience America’s Riviera, Santa Barbara. The Santa Barbara Car Free Project invites visitors to show their Amtrak train tickets and enjoy car free fun (with special discounts) in Santa Barbara. Laura Kath with Santa Barbara Car Free joins us with all the needed 411. Through December 31, 2016, travelers to Santa Barbara can show their Amtrak tickets (paper, e-ticket, or mobile device) to the following attractions and activities for specials and experiences: Adventure Company of Santa Barbara (kayaking & surf lessons), Captain Jack’s Tours & Events (wine tasting or horseback riding), Celebration Cruises (Lil Toot & Azure Seas sailing), CONDOR Express (whale watching), I Bike Santa Barbara (cycling wine tours), Pali Wine Company, Santa Barbara Maritime Museum, Santa Barbara Trolley Company, Santa Barbara Zoo, Segway of Santa Barbara, Sunset Kidd Sailing Cruises and Wheel Fun Rentals (bikes). Santa Barbara Car Free is an award-winning project founded and led by the Santa Barbara County Air Pollution Control District with more than 100 community partners who are dedicated to making car free vacations care-free. Shrimp is one of the most popular varieties of seafood enjoyed in America. What should you know about sourcing, cooking and enjoying this delicious crustacean? Does size matter? Fresh or frozen? Wild caught or farm raised? Should you pay close attention to where the shrimp comes from? Are there any food safety concerns to be aware of about consuming shrimp? Our own resident seafood authority, Chef Andrew Gruel, joins us with all the specifics. It’s a veritable peel-and-eat feast. Chef Mahon generously shares his recipe for the Kali Burger on Pages 148 – 149 in West Coast Prime Meats Cooks – Professional Recipes For The Home Kitchen. Sherry Yard was Celebrity Chef Wolfgang Puck’s incredible executive pastry chef for Spago Beverly Hills and all his operations for twenty years! 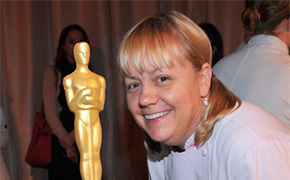 She created all the exquisite desserts for the Governor’s Ball Dinner as part of the Annual Academy Awards festivities for all the years they have been at the Dolby Theater (formerly the Kodak Theater) in Hollywood. She is the recipient of two prestigious James Beard Awards. Sherry also authored two must-have books on the pastry arts, The Secrets of Baking: Simple Techniques for Sophisticated Desserts, and Desserts by the Yard, Recipes from the Sweetest Life Ever. Special thanks to the incredible Sherry Yard for flying back early from Boca Raton to guest-host the show. You’re the absolute best. The James Beard Awards, the Oscars of the food world, are presented annually in early May at Avery Fisher Hall at Lincoln Center. Chefs put on their finery and celebrate achievement in the culinary arts. As Wolfgang Puck’s executive Pastry Chef Sherry Yard is the pastry princess of Los Angeles and beyond. She is the recipient of two James Beard Foundation Awards, the highest honors in hospitality. Her first was in 2000 for “Outstanding Pastry Chef.” She is also the author of two acclaimed books on the pastry arts. Sherry is an active member of C-CAP’s Advisory Board for Los Angeles. She is also the host chef for the “Getting Our Just Desserts” Benefit. Sherry mentors C-CAP students on a regular basis and, over the years, has hired many alums of the program. Many C-CAP success stories have started in Sherry’s pastry kitchens!